Although buying the stuff is going to cost you hard cash, wandering around one of London's colourful markets is free and fun. Browsing stalls, taking in the sights, sounds and smells is a pleasant way to spend a few hours. From the fresh blooms of Columbia Road Flower Market to the bric-a-brac on Brick Lane, the capital's offerings are as diverse as they are colourful. 'London's Larder' is a must for food fanatics, bring empty bellies and deep pockets. Brick Lane Market is pure East End London, which means Jewish bagel shops, Bangladeshi curry houses, Indian sari silks - and Cockneys crying out their wares. This chaotic, bustling market is half way between jewel and junk heap. It has a loud carnival atmosphere on a warm Sunday afternoon and attracts lots of young Londoners, in search of second-hand furniture, unusual vintage clothes and bits of this-and-that. Plus an opportunity to strut about in their Sunday finest, and possibly even get papped by a style scout. Finish off your outing with an inexpensive Sunday lunch (probably curry) in a local restaurant. The joy of this market is that you never know what you'll find, anything from cheap leather clothes and old magazines to Art Deco furniture - with a lot of old junk in between. Every Saturday a welcome addition comes to Marylebone, making a weekend stroll up the pretty high street an even more attractive proposition. On Saturdays the Cabbages and Frocks Market takes over the grounds of Marylebone Parish Church to the north of Marylebone High Street. The brainchild of the organisers of the London Fashion Designer Sales, there's a good mix of stalls selling everything from oils and balsamic vinegars to hand made jewellery. Hidden among the vintage clothes you can, if you're lucky, find some genuine designer gear at knock down prices. Much of the food on sale is organic with macaroons from Masayuki Hara (formerly at the Caviar House) and Moroccan bedouin food from Abdul (ex-Momo's). Enjoy cappuccinos and cup cakes or take it all in with a freshly squeezed fruit cocktail. Columbia Road is a real experience, the crowds, the boisterous market traders, and the best blooms in London. Lined with chic boutiques, every Sunday this historic street fills with a bright patchwork of hundreds of flower stalls. Columbia Road is the capital's most colourful and sweet-smelling market. Flowers, shrubs, bedding plants and other horticultural delights are all for sale. As well as cut flowers, there are topiary trees, pot plants, hanging baskets, bulbs and bouquets turning the street to blossom. The 52 stalls and surrounding shops sell everything to cater for that English obsession - gardening. With most of the traders being based in Essex, many of the plants and flowers are grown and produced locally. The market is open from 8am to 3pm - the best bargains are to be had towards the end of the day when prices reach rock bottom and the competitive sales pitches from the stall holders reach new volumes. There are plenty of attractive cafes, pubs and authentic sea-food stalls where you can make a pit-stop if you get peckish. If flowers don't take your fancy, there's some really interesting art, crafts, antique and fashion boutiques to browse. If getting there by Tube, Old Street is the best station to go to, turn left on exit, walk along Old Street into Hackney Road and after 200 metres turn right into Columbia Road. You'll smell it before you see it. Thousands of Londoners flock to Greenwich for arts, crafts and antiques. Greenwich boasts a number of glorious markets offering a variety of traditional, hand-crafted goods, antiques, clothing and food stalls. The craft market is held at College Approach and the antique market is off Greenwich High Road. The craft market offers a colourful collection of exotic arts and crafts. Established in 1849 there are 120 stalls stacked with distinctive goodies. Wooden toys, model ships, trendy clothes, handmade jewellery and wonderful accessories are some of what is on offer. The market is also bristling with young-designers. The antique market consists of all manner of stalls to entertain, from crafts to vintage clothing and a good selection of food to enjoy from curries to burgers. Finish your market tour off with a walk along the river or the park. Historic covered market in the heart of the city, great for perusing and snacking. Leadenhall Market is a restored Victorian covered market that sells traditional game, poultry, fish and meat. Although there has been a forum (market place) on where Leadenhall Market stands today since the first century AD, the current wrought iron and glass building was designed in 1881 by Sir Horace Jones (architect of Billingsgate and Smithfield markets). Close to the Lloyds of London building and the Bank of England, it's a popular place for city workers on lunch break so the best time to visit is early lunchtime as it gets very busy by 1pm. It's open Monday to Friday from 11am-4pm and is found in Whittington Avenue, off Gracechurch Street Leadenhall is not only a scenic market place which makes for a lovely stroll around, it also sells some of the finest food in London. Head to Petticoat Lane Market for knock-off designer bags, bargain fashions and a bit of haggling. Petticoat Lane is London's world-famous Sunday market and sells mainly clothes for men, women and children, from street-cred clubwear to over-orders of designer goods and last year's must-haves. One of its specialities is leather wear at the Aldgate East end and there's bric-a-brac, household goods, in fact everything you could possibly think of plus some other bits and bobs too. The market is held in and around Middlesex Street on Sundays from 9am to 2pm, with a smaller market open on Wentworth Street from Monday to Friday. Confusingly, Petticoat Lane doesn't actually exist any more - we have the Victorians' prudishness to thank for that, wishing to avoid any reference to undergarments they changed the name to Middlesex Street in 1846. With more than 1,000 stalls lining the streets on a Sunday bargain hunters come in their droves, it's a great scene worth the trip even if you're not shopping. Nearby areas of interest include Brushfield Street where the old Spitalfields Market is held and which offers more in the way of quality. Petticoat Lane may be London's biggest street jumble sale but for bargain hunting, with a bit of haggling thrown in, it's the original and the best. Portobello Road is the world's largest antique market and a firm favourite with tourists. The famous Portobello Road antiques and flea market in Notting Hill takes place every Saturday although there are also stalls from Monday to Friday. Running from Chepstow Villas to just under the Westway, it is a colourful, dynamic stretch of London that oozes trendiness and fun. On Saturday, it's huge, with over 2,000 stalls, selling everything from books to bric-a-brac and lace to Limoges - everything from fresh fruit, fashion and exotic cooking ingredients are on sale. Thousands of people mill around browsing second-hand clothing stalls or choosing outlandish material. For those who have the patience to search, there are some fantastic bargains. This really is the place to shop-and-eat and then shop some more while soaking up the bo-ho atmosphere. It is best to go in the morning, by the afternoon you will find yourself getting a little flustered winding your way through the crowds. Eclectic and quirky jewellery, clothing, crafts and antiques. The perfect antidote to the highstreet. Nestled in the heart of the City, in the shadow of Christ Church, Spitalfields Market marries market stalls with modern shops and restaurants. Where the delightful old covered market used to be, just off Brushfield Street if you're coming from Liverpool Street Station, you'll find stalls alongside glass fronted shops. The stalls are the place to look for something original, of excellent quality and value for money. Sundays are by far the busiest, with over 150 stalls operating. On weekdays between 10am and 4pm the markets' varied stalls are quieter, except at lunchtime, when the choice of eating places attracts the young City crowd. There's so much to do and see here - and plenty of interesting one-off shops with character surrounding the covered market too. Spitalfields has evolved, combining the appeal of the old market with the new so you get brands like Canteen, Agnes B and Benefit behind the large glass fronted stores happily sitting next to sole traders selling quirky clothes and homemade chocolate brownies from their market stalls. Several markets wrapped into one canalside shopping experience. Hidden down a cobble-stoned Angel backstreet a whimsical collection of odds and ends have been gathered together on a selection of market stalls. Intermingled among elegant antique shops and restaurants, it is very easy to spend a day perusing through the muddle of goodies. The antique shops themselves are the real hidden gems of Camden Passage. There is a much admired doll and toy dealer, a specialist long case and mantel clocks vendor and the 'Georgian Village' is full of ornate glass and precious china. There are also some high quality vintage clothing and jewellery stalls to be found. Most of the traders are specialists, they know their stuff and can be a lot of fun to chat to. Strive to find the bargains; prices can be high so haggling is essential. Many of the smaller shops and stalls are only open on Wednesdays and Saturdays, but the larger antique furniture shops may open on other days if visitors ring the bell. 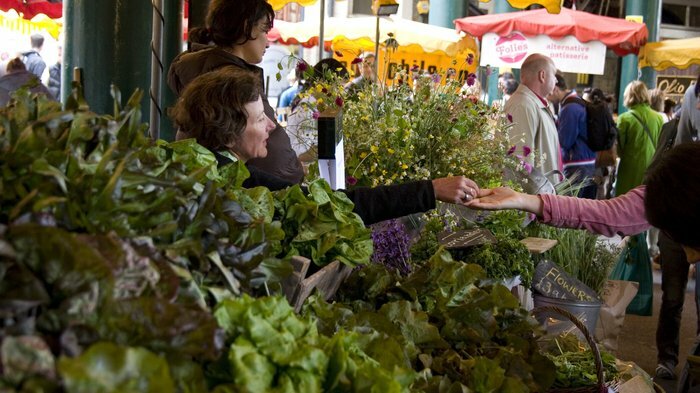 Every Sunday Camden Passage hosts a popular farmers' market selling a range of locally grown organic foods. Broadway is a great little market that is expanding rapidly and enjoys a tremendous reputation, especially with young and cool East Londoners. Positioned nicely between Regent's Canal and London Fields. It's worth the trip down there as there's a tremendous variety of interesting goods and some great opportunities for people watching. There's also a good selection of organic food including rare breed pork, veal and venison, sea food and fresh fish, handmade cheese, butter and butter milk, fair-trade coffee, and organic breads, cakes and pastries. Health products are sold alongside vintage clothing from the 50s, 60s and 70s, including USA street wear. Broadway has a tradition in enabling the city's people to eat; livestock would travel through what is now Broadway Market from London Fields, the last common grazing area, before their final stop at Slaughter Street in Brick Lane or East Smithfield. Broadway was also one of the original chartered open markets in London, a thriving market place some thirty years ago. It's good to see it firmly back on the map. One of East-London's least gentrified markets, loud, smelly and full of character. This mixed market has a strong emphasis on food, catering for a wide variety of tastes from Afro-Carribean fruit and veg to Asian spices and plenty of fresh fish too. But it's not just the place to go for affordable food, Ridley Road Market also offers cheap clothes and household goods from a six pack of knickers to washing up liquid. Best of all, though, is the excellent selection of exotic food - quality varies from stall to stall so make sure you shop around. From cheap budget accommodation to luxury 5 star hotels see our discounts for hotels, including DoubleTree by Hilton London - Marble Arch from 44% off.